There is a phrase that circulates among historians and scholars: "Fifteen books can be wrong and one hundred websites are wrong." The adage relates to the fact that few people do the legwork when it comes to research... which is often the cause of the same mistake being reprinted over and over. While I agree with those who debate that it is easier (and cheaper) to consult prior published reference guides and websites, that method cannot ensure facts. What ultimately results in this flaw is the reprinting of mis-information, giving people the false assumption that if something is printed in five or six books, it must be the gospel. And such methods is nothing more than cut-and-paste applying grammatical cosmetics. 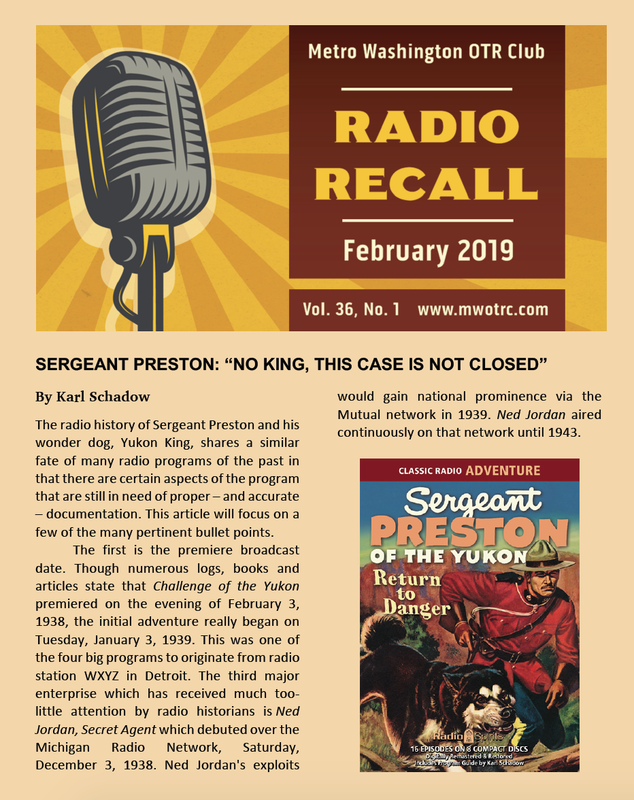 No better example can be found than the Sergeant Preston of the Yukon radio program. 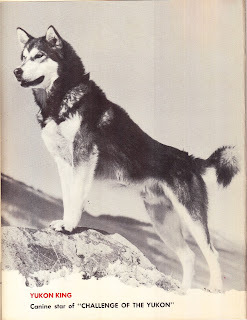 Sergeant Preston of the Royal Canadian Mounties who, with his wonder dog Yukon King, set about on weekly adventures to thwart the schemes of fur thieves, claim jumpers and murderers. For many who lived in Detroit, Michigan, where the radio broadcasts originated, this was a brass-buttoned, red-coat rendition of the successful Lone Ranger radio program. Preston had a magnificent steed, Rex, who raced steadfast to the scene of the crime when King, usually leading the sled dogs, could not assist with transportation as fast as his four-legged friend... but King, take note, with sharp teeth was able to disarm villains with guns and save Preston from harm. In September 1950 the name of the program changed to Sergeant Preston of the Yukon. 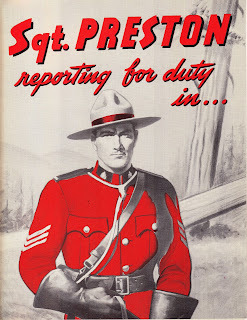 The reason for the name change, recently unearthed while reviewing archival documentation, was to protect the property of the fictional mountie. 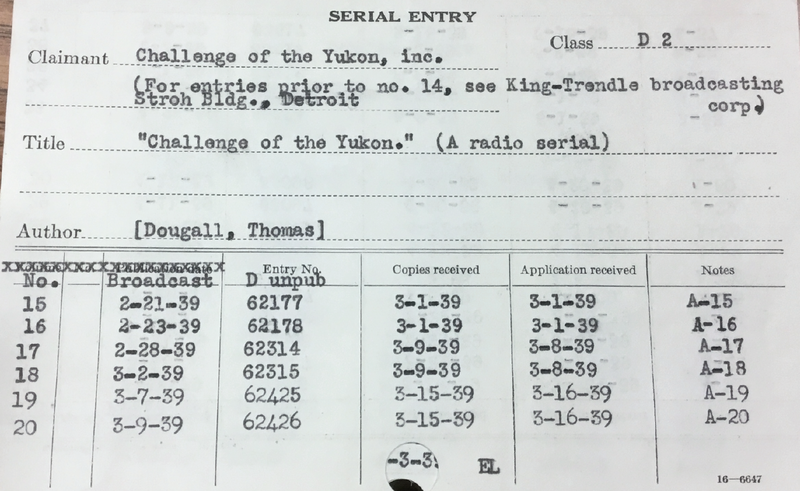 It was impossible -- legally -- to copyright or trademark a fictional character as Canadian Mounties were commonplace before the creation of the radio program but the name of the character was a different matter and copyrighting each radio script under the name of the program (ala name of character) would hold court with legal defense. In answer to the question above, too many people believe what they read on the Internet and are quick to reprint the facts without doing any real legwork. If two dozen books say 1938, and hundreds of websites claim 1938, then they assume 1938. But had anyone actually done what Karl took time and effort to accomplish, browsing through the original radio scripts, consulting historical documents in archives, and numerous other sources, they would have realized the 1939 is carved in granite. Which leads us back to that phrase that circulates among historians and scholars: "Fifteen books can be wrong and one hundred websites are wrong." 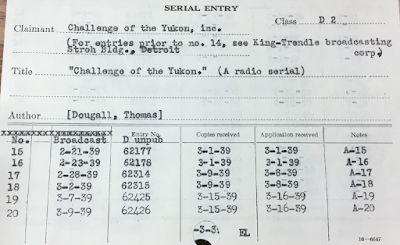 Challenge of the Yukon premiered in January 1939, not February 1938.